I remember a dinosaur game from when I was little, I probably played it around 1998-2000's. In this game, dinosaurs could speak english and some would dress in clothes. I remember going to visit a female dinosaur with a crown like object around her head, she might have been part of royalty or an ambassador. She stood on 2 feet. There would be scenes inside a castle and the most vivid part I can remember is going downstairs into this chamber and talking to a really creepy guy. And from there, there was a secret passage way to somewhere lower. It would open into a room that had skeletons in open coffins and I remember the music sounding so scary in this part, that I'd cry and leave the room. I wasn't old enough to think about turning down the music. But now I'd like to play and get past this part. I also remember there being missions of having to leave and gather ingredients. I'd go into a forest and pick mushrooms. 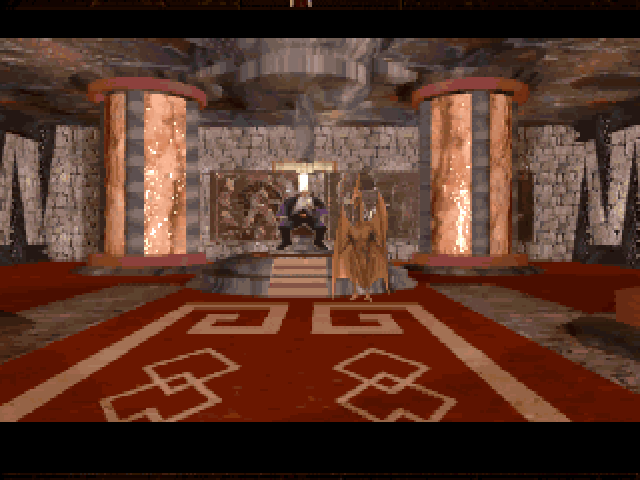 The style of the game was on the realistic side of things (as good as the graphics could get then). It was a first-person view game and I believe you had to click on something to move to different areas. There were some humans in the game, I think the king was one. That maybe why I was leaning towards the female dinosaur to be an ambassador of some sort. They were human skeletons in the coffins, and the coffins were vertical, so they looked to be standing inside of them. The "crown" that I remember on the female dinosaur was more like a diamond necklace that was laid on her head, like an elegant crown. There was a really creepy man in it! He had his tongue cut out so it was really hard to understand him. Lost Eden is an adventure game set on an eerie planet populated with dinosaurs. Your civilisation is menaced. Armies of Tyranns, led by Moorkus Rex, are gathering around your kingdom. Soon they will swarm in, destroy everything and kill your people. However, there is a single hope. There are legends telling that several hundreds of years ago, men and dinosaurs cooperated to build 5 mighty Citadels that were almost invulnerable to the Tyranns. Today, all the Citadels but one have been destroyed. 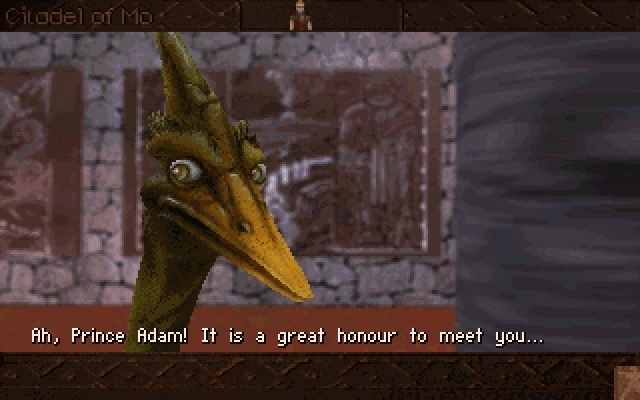 You play as Adam of Mo, you must rediscover the secret of uniting men and dinosaurs, rebuild the Citadels, and finally defeat Morkus Rex and his armies. Released for MS-DOS and Macintosh. In this game, dinosaurs could speak english and some would dress in clothes. I remember going to visit a female dinosaur with a crown like object around her head, she might have been part of royalty or an ambassador. She stood on 2 feet. There were some humans in the game, I think the king was one. That maybe why I was leaning towards the female dinosaur to be an ambassador of some sort. The king is a human and your father. When you first met him, he is next to Eloi, a dinosaur messenger from north who stands on two feet, although it doesn't match your description of being a queen or having a crown. This walkthrough seems to describe your experience, assuming that the "Monk" is the "really creepy guy". Go to the Monk's chamber and take a closer look at your ancestors. One teeth seems to be missing and your highness has a teeth from Jabber. Try to put that teeth into mummy's mouth. So the secret passage is revealed. Muster all your courage and dive to the subterran tunnels. Wait ! Isn't it the dreaded Moorkong bellowing in the darkness beyond ? It might be dangerous but I advice you to go ahead. There is a skeleton guarding your path. I also remember there being missions of having to leave and gather ingredients. I'd go into a forest and pick mushrooms. Now you have to find a shaded forest and get some mushrooms from there. The style of the game was on the realistic side of things (as good as the graphics could get then). It was a first-person view game and I believe you had to click on something to move to different areas. As you can see from the above screenshots, this game seems to describe your experience. It's also available for purchase on both GOG.com and Steam! Could this be Blazing Dragons, released on PlayStation and Sega Saturn? The cover of the game has a dragon wearing clothes. I remember going to visit a female dinosaur with a crown like object around her head, she might have been part of royalty or an ambassador. According to Wikipedia: "The player's overall quest is to become a dragon knight to compete in the grand tournament and win the heart of Princess Flame." Part of the game takes place inside of a "Castle Grim". It was a first-person view game and I believe you had to click on something to move to different areas. The game is a point-and-click play style. Not the answer you're looking for? Browse other questions tagged story-identification video-games or ask your own question. What is the name of this sci-fi strategy video game?